SCM is divided into two types- type 1 consisting of two hemicords, each of which has its own dural sheathed tube while being separated by a median bony spur; and type 2 that consists of two hemicords housed in a single dural tube separated by a fibrous median septum. Of late, with slight modification of Pang's classification by Kumar et al., and Mahapatra et al., it is now obvious that SCM is not always occult and may coexist with open spinal dysraphism, like meningomyelocele (complex spina bifida) in a significant number of cases. It is also surprising that about 40.8% cases of all SCM present with meningomyelocele, suggesting that open and closed form of spinal dysraphism can coexist. Composite type SCM is very rare and results from two separate foci of ectoendodermal adhesions and endomesenchymal tracts,  leading to development of different SCM types with intervening normal cord in the same patient. Only a few cases of composite type SCM have been reported in literature. 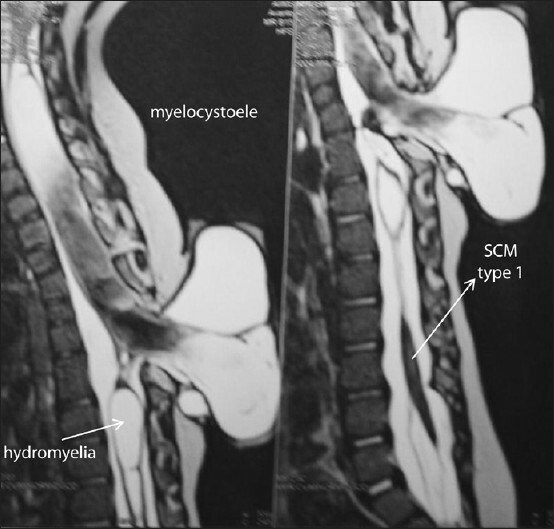 ,,,, In this report, we present a case of composite type of SCM with a dorsal non terminal myelocystocele, two level SCM type 1 and single level SCM type 2, hydrocephalus and coccygeal dermal sinus. 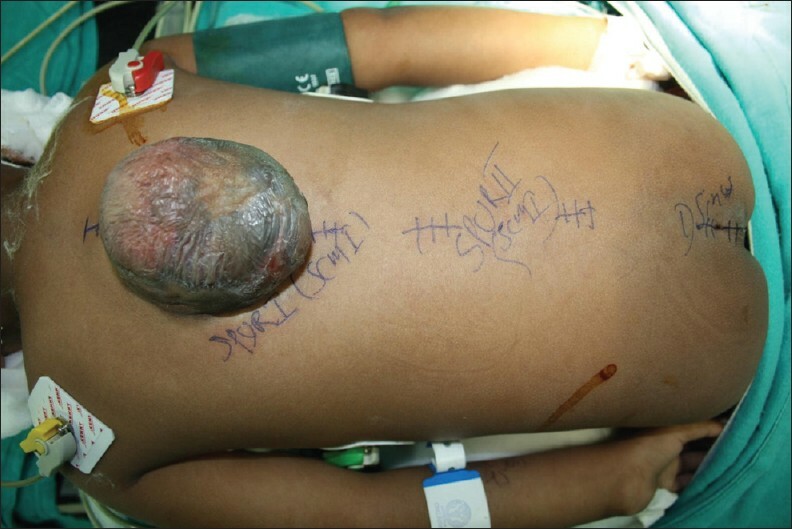 To our knowledge, this is the first reported case of composite type of SCM with a non terminal myelocystocele, hydrocephalus and dermal sinus, operated at 5 different sites during the same surgery. A 4-year-old-female child, with a swelling in the upper back since birth associated with difficulty in standing and walking, came to our institute. There was a positive history of cerebrospinal fluid (CSF) leak from the swelling, with no history of high grade fever, delayed developmental milestones or bowel or bladder incontinence. On physical examination, the swelling was in the mid thoracic region and was measuring 8 × 6 cm [Figure 1], with a dermal sinus at coccygeal level. Muscle tone was decreased bilaterally in the lower limbs with the power in lower limbs being 4/5, and deep tendon reflexes diminished. Imaging of whole spine showed a thoracic non terminal myelocystocele present from D6-10 level, [Figure 2] and [Figure 3] with bony spur at D7-D8 and L2-L3 level and fibrous spur at D10 in computed tomography scan (Computed Tomography Scan in [Figure 4] ) and hydrocephalus. Right sided low pressure ventriculoperitoneal shunting was done in supine position, following which the patient was made prone, and excision with repair of thoracic non terminal myelocystocele arising from left hemicord at D7-D8 level, with excision of a bony spur at same level was carried out. SCM type 2 present at D10 level, and SCM type 1c spur at L2-3 (as per the classification given by Mahapatra and D Gupta), , was removed. Split conus medullaris and filum terminale were present, and resection of fatty filum terminale was done. Dermal sinus present in coccygeal region was removed. Patient received IV methyl prednisolone intra operatively. Surgery took 8 hours and patient was reversed from anaesthesia post operatively. In immediate post operative period, patient developed mild weakness of right lower limb (power 3/5) but the power gradually improved. She received methyle prednisolone for 3 days, cloxacilline and amikacin for 8 days. She was discharged on post operative day 10 with the same muscle power as in the pre operative period. SCM includes the rare congenital anomalies of the spinal cord and its covering. It was first termed as "diastematomyelia" by Ollivier  in 1837, who described the condition as an abnormality of the spinal cord in which the dura is separated by a bony spur, or by rigid fibrous bands, which creates two different sleeves, each containing a portion of the spinal cord, divided into two parts sagittally. Bruce et al.,  used the term "diastematomyelia" to describe a spinal cord split by a midline bony spur, and reserved the term "diplomyelia" for a true doubling of the spinal cord without a spur. Feller and Stenberg  were the first to implicate a notochordal cleft caused by persistence of a midline cell rest as the cause of diastematomyelia. Pang  in 1992 gave a new classification recommending the term "SCM" for all double spinal cord malformations. He also described the unified theory, which explains the embryologic mechanism of development of all variants of SCM. According to the theory, the formation of an "accessory neuroenteric canal" between the yolk sac and amnion through the midline embryonic disc was the main cause of the defects. This canal gets subsequently invested with the mesenchyme to form an endomesenchymal tract, which causes the splitting between the notocord and neural plate. The location of this abnormal fistula is variable, but it must be rostral to the primitive neuroenteric canal, because the primitive pit into which the latter normally opens, ultimately comes to lie opposite the coccyx. If the precursor cells within the endomesenchymal tract form a bony septum, it is called Type 1 SCM. In case the mesenchymal tract forms a fibrous band that divides the hemicords in one dural sac, it is called as Type 2 SCM. Thus the accessory neuroenteric canal can be regarded as the key point in the development of this type of malformation. The canal maybe single or multiple, and the presence of multiple accessory neuroenteric canals results in two or more septae that divide the spinal cord into hemicords; hence, one or more types of SCM may develop in these patients at different levels. Pang in 1992  reported about two such cases of composite type of SCM, out of total 39 case studies, and Ersahin et al. reported on 4 such cases out of 74 cases of SCM in their study. The frequency of composite type SCM was reported as less than 1% by Harwood - Nash and McHugh. Vaishya and Kumarajain  also reported about three cases of composite type of SCM. Kamil and Yusuf  reported a rare composite type of SCM of two different types at three different levels in the same patient. Myelocystocele has been described in literature from a long time; however, the term "non terminal myelocystocele" has been only recently added by Rossi et al. Our patient is unique than the cases previously presented in literature in having three different levels of spur at D7-8, D10 and L2-L3 level, non terminal myelocystocele arising from the left hemicord at D7-D8 level, bifid fatty filum, coccygeal dermal sinus and hydrocephalus. What makes it all the more unique is that, all the different lesions were managed in a one-stage operation over a period of 8 hours. Prolonged surgery at multiple sites can have various complications like severe blood loss, and can cause hypothermia especially in children, and thus cause post operative morbidity. Our patient withstood the surgery well; however, had post-operative pyrexia for 5 days. Though the culture results were negative, antibiotics were continued for 8 days due to the fever. The clinicoradiological findings in our patient further substantiate the multiple accessory neuroenteric canal theory in the development of composite type of SCM. Physical and neurological signs of SCM and nonterminal myelocystocele in a patient should prompt the neurosurgeon to consider performing the screening MRI of whole spine with brain to rule out other composite type SCM and hydrocephalus. 1. Karsvik HE, Keller MS. Sonography of occult dysraphism in neonates and intants with MR imaging correlation. Radiography 1992;12:297-306. 2. Reigel DH, Rotenstien D. Spina bifida: In section of Pediatric neurosurgery of the American association of neurological surgeon. Pediatric neurosurgery. 3rd ed. Philadelphia: Saunders; 1994. p. 51-76. 3. Kumar R, Singh V, Singh SN. Split cord malformation in children undergoing neurological intervention in India: A descriptive study. J Pediatr Neurol 2004;2:21-7. 4. Pang D, Dias MS, Ahab-Barmada M. Split cord malformation part I: Unified theory of embryogenesis for double spinal cord malformation. Neurosurgery 1992;31:451-60. 5. Kumar R, Bansal KK, Chhabra DK. 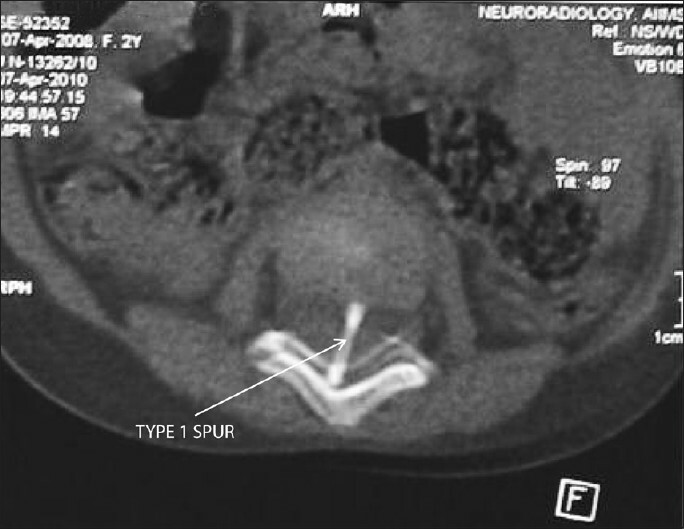 Occurrence of split cord malformation in meningomyelocele: Complex spina bifida. Pediatr Neurosurg 2002;36:119-27. 6. Pang D. Split cord malformation: Part II: Clinical syndrome. Neurosurgery 1992;31:481-500. 7. Ersahin Y, Demirtas E, Mutluer S, Tosun AR, Saydam S. Split cord malformations: Report of three unusual cases. Pediatr Neurosurg 1996;24:155-9. 8. Gower DJ, Del Curling O, Kelly DL Jr, Alexander E Jr. Diastematomyelia-A 40-year experience. Pediatr Neurosci 1988;14:90-6. 9. Harwood-Nash DC, McHugh K. Diastematomyelia in 172 children: The impact of modern neuroradiology. Pediatr Neurosurg 1990-1991;16:247-51. 10. Vaishya S, Kumarjain P. Split cord malformation: Three unusual cases of composite split cord malformation. Childs Nerv Syst 2001;17:528-30. 11. Gupta DK, Mahapatra AK. Classification of type I split-cord malformations: A Prospective study of 25 cases. Pediatr Neurosurg 2006;42:341-6. 12. Mahapatra AK, Gupta DK. Split cord malformations: A clinical study of 254 patients and a proposal for a new clinical-imaging classification. J Neurosurg 2005;103 Suppl 6:531-6. 13. Ollivier CP. Traité des maladies de la moelle épinière. Mequignon-Mar -vis, Paris, 1837. 14. Bruce A, M'Donald S, Pirie JH. A second case of partial doubling of the spinal cord. Rev Neurol Psychiatry 1906;4:6-19. 15. Feller A, Stenberg H. Zur Kenntnis der Fehlbildungen der Wirbel säule. I. Die Wirbelkörperspalte undihre formale Genese. Virchows Arch [A] 1929;272:613-40. 16. Pang D. Split cord malformation, Proposal for a New Clinicoradiological. Neurosurg Clin N Am 1995;3:339-52. 17. Akay KM, Izci Y, Baysefer A, Timurkaynak E. Composite type of split cord malformation: Two different types at three different levels: Case report. J Neurosurg 2005;102 Suppl 4:436-8. 18. Rossi A, Piatelli G, Gondolfo C, Pavanello M, Hoffman C, Van Goetherm JW, et al. Spectrum of nonterminal myelocystoceles. Neurosurgery 2006;58:509-15.